5 October 2003: At least one billion people live in slums, with the highest percentage of them found in Asia, Africa and Latin America, according to a new report by the United Nations Human Settlements Programme (UN-HABITAT). The UN report The Challenge of Slums: Global Report on Human Settlements 2003 was published on World Habitat Day, 6 October 2003. At a press briefing, Anna K. Tibaijuka, UN-HABITAT executive director, told CityMayors that at least 40 per cent of settlements in the world were classified as slums. The UN Millennium Development Goals, Ms Tibaijuka said, had recognised the problem of slums and had sought to improve the living environment in cities and towns. Some 71 per cent of city-dwellers in sub-Saharan Africa live in slums, and the figure is 40 per cent for Asia and six per cent for developed nations, she explained. 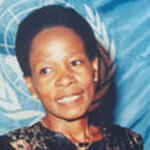 Ms Tibaijuka continued that slums were not inevitable even though they existed. The UN-HABITAT report, the first global assessment of slums, had attributed the formation of slums to, among other things, the rapid pace of rural-to-urban migration and the urbanisation of Africa, Asia and Latin America. According to the report increased political will, investment in infrastructure, proactive urban planning and the empowerment of the urban poor were all ways of tackling the problem. The deterioration of the living environment was not limited to the poorest countries, and the reports recommendations were aimed at the entire world. Jeffrey D. Sachs, Special Adviser to UN Secretary-General Kofi Annan on the Millennium Development Goals and Director of the Earth Institute identified urbanisation as one of the most powerful trends in the world today. Evidence pointed to the fact that cities were the core of economic growth in the long term, which was promising from the aspect of determining how developing countries could grow and get integrated into the world economy. He stressed that while that was promising, the problem lay in the fact that people were either not finding productive employment for income generation or having the necessary infrastructure - or both. Key findings in the report show that Asia has about 550 million people living in slums, followed by Africa with 187 million, and Latin America and the Caribbean with 128 million. While slums have largely disappeared in developed countries, the report still found that there were approximately 54 million urban dwellers in high-income countries living in slum-like conditions. The UN findings also revealed that sub-Saharan Africa had the highest rate of slum-dwellers with 72 per cent of the urban population living in slums, followed by South Central Asia with 59 per cent, east Asia with 36 per cent, western Asia with 33 per cent, and Latin America and the Caribbean with 32 per cent. Although the concentration of slum dwellers is highest in African cities, in numbers alone, Asia accounts for some 60 per cent of the worlds urban slum residents. The report stresses the urgent need to do much more to improve the lives of slum-dwellers.  Some 923,986,000 people, or 31.6 per cent of the worlds total urban population, live in slums; some 43 per cent of the urban population of all developing regions combined live in slums; some 78.2 per cent of the urban population in the least developed countries live in slums; some six per cent of the urban population in developed regions live in slum-like conditions.  The total number of slum-dwellers in the world increased by about 36 per cent during the 1990s and in the next 30 years, the global number of slum-dwellers will increase to about two billion if no concerted action to address the challenge of slums is taken. 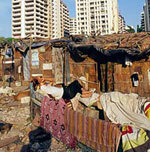  More than 41 per cent of Kolkatas (Calcutta) slum households have lived in slums for more than 30 years.  In most African cities between 40 per cent and 70 per cent of the population lives in slums or squatter settlements. Many African cities will be doubling their population within two decades. In a city like Nairobi, 60 per cent of the population lives in slums which occupy about five per cent of the land.  While most slum-dwellers depend on the informal sector for their livelihoods, slum populations in many parts of the world (for example in Pune, India and Ibadan, Nigeria) quite often include university lecturers, university students, government civil servants and formal private sector employees.  About one out of every four countries in the developing world has laws that contain clauses that impede women owning land and taking mortgages in their own names.  All slum households in Bangkok have a colour television.  Slums are also places in which the vibrant mixing of different cultures has frequently resulted in new forms of artistic expression, including some of the major musical and dance movements of the 20th Century, such as jazz, blues, rock and roll, reggae, funk, hiphop, soukuss, breakdance, fado and flamenco. In 1978, when Habitat was established after a meeting in Vancouver known as Habitat I, urbanisation and its impacts were less significant on the agenda of the United Nations that had been created over three decades earlier, when two-thirds of humanity was still rural. From 1978 to 1997, with meagre support and an unfocused mandate, Habitat struggled almost alone among multi-lateral organisations to prevent and ameliorate problems stemming from massive urban growth, especially among cities of the developing world. From 1997 to 2002, by which time half the world had become urban, UN-HABITAT  guided by the Habitat Agenda and the Millennium Declaration  underwent a major revitalisation, using its experience to identify emerging priorities for sustainable urban development and to make needed course corrections. In 1996 the United Nations held a second conference on cities, Habitat II, in Istanbul to assess two decades of progress since Vancouver and set fresh goals for the new millennium. Adopted by 171 countries, the political document that came out of this 'City Summit' is known as the Habitat Agenda and contains over 100 commitments and 600 recommendations. On 1 January 2002 the agencys mandate was strengthened and its status elevated to that of a fully fledged programme of the UN system in UN General Assembly Resolution A/56/206. Key recommendations and fine tuning of the agenda are now underway as strategy clusters for achieving the urban development and shelter goals and targets of the Millennium Declaration - the United Nations development agenda for the next 15 to 20 years. The revitalisation has placed UN-HABITAT squarely in the mainstream of the UNs development agenda for poverty reduction with a more streamlined and effective structure and staff, and more relevant and focused set of programmes and priorities. It is through this agenda that UN-HABITAT contributes to the overall objective of the United Nations system to reduce poverty and promote sustainable development. Its partners range from governments and local authorities to a wide international cross-section of Non-Governmental Organisations and civil society groups.